Rockland County, NY - Four days after a 32 page report made numerous suggestions for changes in the troubled East Ramapo School district, local members of the Orthodox Jewish community continue to express emotions ranging from disappointment to outrage, including one county legislator who stepped down from a leadership position citing a conflict of interest. As previously reported on VIN News, a three person committee headed by former New York City Schools Chancellor Dennis Walcott observed the district for a 17 week period and recommended 19 improvements which included appointing a monitor with veto power over the school board. Other recommendations included appointing a monitor to insure the fairness of all elections, a possible end to gender segregated busses and ensuring that one school board seat in every election be dedicated exclusively to public school parents. The report, which stated that the school board was successfully working hand in hand with the monitoring team, also acknowledged that the district is woefully underfunded and recommended that the state allocate additional monies to East Ramapo. 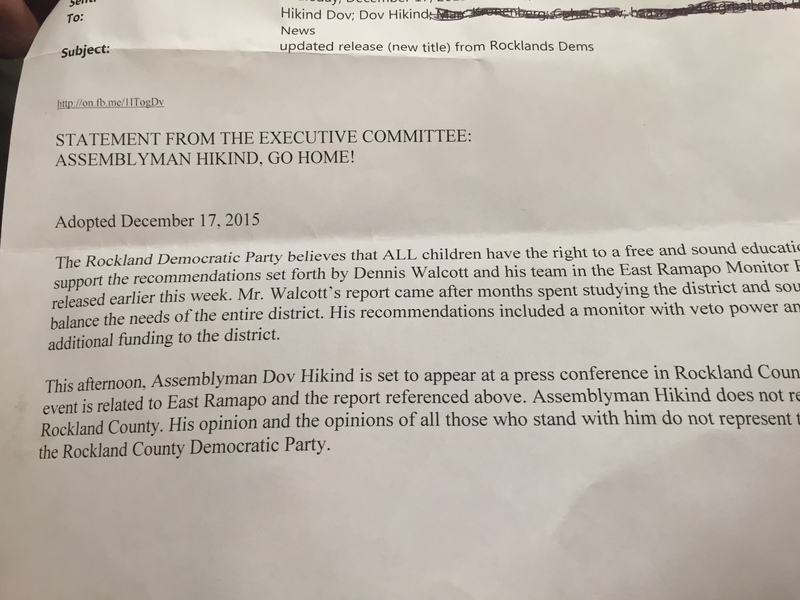 East Ramapo school board member Harry Grossman said that board was shocked by the contents of the report. Grossman described certain sections of the report as “chilling,” saying that its insistence that one school board position be open only to candidates who are public school parents who have been chosen by an unspecified process that would exclude private school parents at every election was highly problematic. “There was every reason to be hopeful that continued cooperation between the monitors and the board would have resulted in further progress on these critical fronts. Unfortunately, these new recommendations may now set us back considerably,” said Rabbi Chaim Dovid Zwiebel, executive vice president of the Agudah, in the statement. At a press conference held this afternoon in the Rockland County Legislative Chamber in New City, Legislator Aron Wieder resigned his position as Democratic majority leader. “The reason I chose this drastic step, to resign, was because some have turned my position as majority leader and strong advocate to protect constitutional rights and civil liberties of the Orthodox Jewish community here in Rockland County into a distraction away from the work of the county legislature and the democratic caucus,” said Wieder. 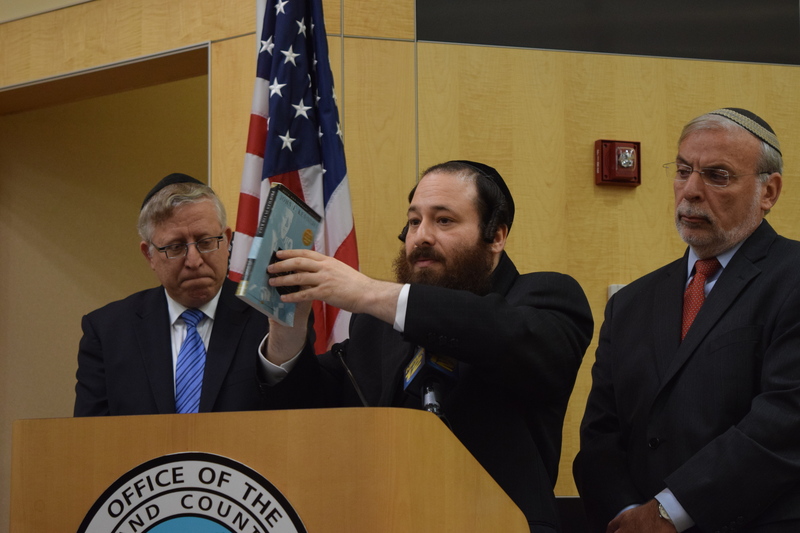 Wieder expressed incredulity at the contents of the report saying that there was a sense of optimism that better times were in site for the beleaguered district, with racial and religious tensions in East Ramapo finally starting to diminish. Waving his own copy of John F. Kennedy’s Profiles in Courage, Wieder displayed the final page of the book, which is completely blank, observing that he had hoped that a new chapter, describing positive changes for all of the district’s children, was about to be written in the history annals of East Ramapo. Quoting Rabbi Zwiebel who was unable to attend today’s press conference, Rabbi Golding singled out the report’s recommendation that a monitor be appointed to oversee future school board elections. Hikind chastised Democrats who objected to his presence and expressed bitter disappointment in Dennis Walcott, who he described as a good friend and colleague. Hikind noted that when Walcott was appointed to head the team of monitors he personally assured East Ramapo’s Jewish community that Walcott would be fair and that over the last several weeks there was every reason to believe that there was a brighter future ahead. “Unfortunately, and it pains me to say this, Dennis Walcott stabbed this community in the back,” said Hikind. No questions were taken after the press conference and both Wieder and Rabbi Golding left the room immediately after the conclusion of the press conference. Speaking with VIN News later in the day, Wieder cast doubt on the legality of several portions of the report. In the State of Texes Gov. Greg Abbott has appointed a person to lead the State Board of education responsible of the public school system of over 5 million kids. whose own kids have never attended a public school and believes in home schooling. So I don't see the problem in Ramapo. If we do so in ALL NY then you have a point. Look what is going on in Lakewood when a state monitor was installed. A school board controlled by chareidim will be more interested in funneling aid to the religious schools than in improving the quality of public schools. Why else would they run for the position? And everyone seems to agree that favoritism is what happened in Ramapo in the past. A state monitor makes sense when the natural inclination of a board is to act contrary to its mandate. The board put in a very expensive brand new kosher kitchen in one of the public schools near me for special ed Yiddish kids. Meanwhile, the public school kids have a kitchen that is 20+ years old. The public school kids are not allowed to go to the wing where the Yiddish kids are because their clothing is not "modest". Modest meaning the girls wear slacks. The board is funneling most of the money to yeshivas. There was no forensic auditor and that is the reason why no fraud was uncovered. We need a forensic auditor more than anything else. Let's see where the multi-millions went that were diverted away from public schools. Why are there no monitors in yonkers or mount Vernon where there's declining school productivity? perhaps there should be a veto dictator there with power to double their taxes? there will always be a balancing of higher taxes vs educational quality. The veto tyrant will NOT take this balance into account and will turn east ramapo school into Scarsdale school district - at the expense of the homeowners - and with zero balancing considerations. homeowners across ny are voting against tax increases despite finished educational resources it causes. No veto tyrants there! Just e ramapo and it's only because it's Jewish people calling the shots. it stinks of anti semitism. if the parents of e ramapo really cared about their children they'd move to Scarsdale instead of trying to squeeze money out of a stone that's dry. This board works tireless hours on behalf of ALL kids in the district . You are not half the man that anyone of them are. You sit there and make up stuff about them. Everyone agrees, public school parents have every right to be upset with the cuts to programs that would enhance the education and experience the kids get when going to school. Full day kindergarden, Art, Music and after school programs are vital services the kids should get. The question is how do we as a community pay for those programs? Is there enough money in the budget to allow for those vital programs? The perception that the Board diverted public school funds to fund private school transportation which in turn caused the cuts to programs is false. The sad answer is the 200M+ budget falls horribly short, and sijmply can't meet the needs of the ENTIRE school district. We need to come together as a community and demand Albany allocate our fair share of state funds. Looking at monies spent on private school children transportation is not the answer. Those kids are entitled to, and the ERCSD is mandated BY LAW to pay for those transportation services.They are NOT mandated to pay for Art, Music, or full day kindergaten. Albany directs the School Board on which programs must be funded and the Board must follow those laws,leaving very little room for discrestionary spending. “ In the State of Texes Gov. Greg Abbott has appointed a person to lead the State Board of education responsible of the public school system of over 5 million kids.